Join four to eight week China Summer Volunteer Camp! Are you looking for volunteer abroad opportunities? Are your dreams of volunteering abroad constrained by expensive fees? Then look no further and join our summer volunteering abroad program in China. Teach English to enthusiastic Chinese students during the summer. Take advantage of the Chinese language learning opportunities. The beautiful country of China is a great place to explore, volunteer, and learn. Though modernizing at a rapid rate, China is still rich in ancient culture and traditions. When you join our summer volunteer program in China, you’ll explore this great country and witness the stark contrast between the new and the old, the rich and the poor, and the yin and yang of Chinese culture. This is without a doubt a colorfully diverse and rewarding opportunity. By volunteering in a summer English program in China, you will be a part of a fascinating transformation within the lives of the students to whom you dedicate your time, energy, and compassion. RCDP International Volunteer offers an amazing summer volunteer opportunity in China. We invite you to join our summer camp, share your love and passion for children, and make the upcoming summer unforgettable. Arrival at Pu-dong International Airport in Shanghai. You will be greeted and picked up by an RCDP International Volunteer’s representative and transferred to a hostel in Shanghai. On the second day, you will be orientated on the English summer camp, its objectives and goals, room and food, local culture, traditions, dos and don’ts, customs and you will have a basic introduction to the spoken Mandarin language. You are free to ask questions. After orientation, you will get a brief training on how to teach English to young Chinese children aged between three and 10 years. The summer camp is a special and intensive English teaching volunteer program in China. The camp is mostly focused on improving overall English understanding, especially in conversation. Chinese students are very eager and excited to learn English. So the training will mostly focus on how to achieve the goal of the summer camp and how to teach English to young Chinese students. After the initial orientation and training, you will be assigned to a school where the summer English camp in China will be held. Teaching English to young kids is the core part of the summer program in China. Depending on the program you choose (lasting for either one month or two months), you will be teaching English (mostly conversational English) to young students from kindergarten through 5th grade. In the camp, you will be using your skills and your experience to teach smart, energetic, and enthusiastic Chinese students who are always happy and eager to learn English. Though there will be teaching materials and books in the camp for you to use, we encourage you to bring any teaching materials that you think would be helpful for the students. Depending on enrollment, there will be five to 20 students in a classMost of the summer camp classrooms are equipped with teaching aids such as computers, overhead projectors, and even touch display screens. The class will be well furnished and have air conditioning. You will start your day with coffee and Chinese breakfast. After breakfast, you will arrive at the camp at 9:00 am. After preparation, the actual teaching session will start at 9:30 am. Each class will last for 45 minutes and there will be 15-minute breaks between classes. After the morning session, there will be a one-and-a-half hour lunch break for students and teachers alike. You will be served delicious Chinese food every day. The lunch break is long enough to rest, relax, read, or even take a short nap. After the break, the afternoon session of the summer camp starts at 2:00 pm and lasts until 5:15 pm, with regular classes and breaks similar to the morning session. The day finishes at 5:30 pm. A standard workweek of the summer volunteer programs in China requires between 30 to 40 class hours, with two days off. You will teach from Monday to Friday. After five days of teaching and making memories, you will have Saturdays and Sundays off. This is a time for travel and exploration. China is a great country, rich in history, nature, culture, and tradition. The country is modernizing fast and there are endless opportunities to see this change in action. Use the weekend to explore this incredible country full of friendly people and adventure. Using songs: If possible, try to sing a lovely song, preferably a nursery rhyme or good morning song with actions and sounds. You can bring your own CDs or you can easily download songs through the domestic Internet once you arrive to teach at your volunteer program in China. Using games: Funny alphabet songs and colorful flash cards can be great. You can stick the letters to the wall, and start a little competition to see who can run to the wall to touch the correct letters announced. Always remember to encourage your students! More games online: Use as many free ESL games online as possible to pique the interests of the kids. 9:00- 9:30 - Arrive at camp, go over materials, and prep for class. 10:15-10:30 - Take a short break to prepare for the next class. 11:15-11:30 - Take a short break to prepare for the next class. This program is open only to native English speakers (citizens of US, UK, Canada, Australia, Ireland and other English speaking countries with English as a mother language). There are NO teaching or academic qualifications needed to join this volunteer project in China. We welcome college or university students who want to be future teachers or are eager to teach young children in China. This is also a wonderful opportunity for retired teachers who want to share their experience and explore the world. Currently, we offer a four-week and an eight-week summer English camp in China for $399. Depending on your interests, you are free to choose the program that suits you best. English Camps in China are located in Shanghai and nearby cities. If we get a large number of teachers, we may run the camps in the other cities, so we expect location flexibility from our volunteers. Simply fill out the form to apply tosummer volunteer teaching project in China. You will need to pay US $ 399 as a registration fee. Once we receive your application, we immediately forward it to our country coordinator in China, who will go over your application very carefully. He may ask for your résumé, photo, or more information to process your application. Is there a selection process? When do I get a notice of acceptance? Yes, there will be a screening process to select the right candidates for the camp. The Chinese schools that run the summer camps have some expectations and requirements when it comes to teachers. Therefore, we screen the teachers to meet the needs of the camp. We may also set up Skype interviews as part of the selection process if necessary. You will get an acceptance letter from our China coordinator within seven days of applying. When should I apply for this program? We strongly recommend volunteers/teachers to apply at least two months in advance. When you apply in advance, it helps you to get ready and have peace of mind. To visit China, you need to prepare your airfare, visa, vaccinations, among other things. Since these require time, it is best to apply in advance. What is the age limit required for volunteers? The program is open for any native English speak of age range is between 16 and 60 years old. Can I apply if I don’t know any Chinese? Knowledge of Chinese language is not needed to join the program. Do we get a certificate after the camp? If you are thinking of developing your career as a teacher or if you want to improve your resume, we will be happy to issue a certificate for joining the volunteer programs in China. We will send it to you with the official Letter Head of RCDP International Volunteer. If you need this, you should inform us when you apply, since we need to get this certificate printed out and posted to you while you are in China. The summer camp teaching program in China is volunteer based. It is not a paid teaching program where you need a work visa. Since you will not receive a salary, and you are just coming to China to help and travel, please apply for a tourist visa (L). We do not manage visas, so please get a tourist visa from your home country. However, if you need an invitation letter (although it is not usually needed to go to China for volunteering and travel), please let us know. Do I need travel insurance? Who provides health insurance? Travel insurance is extremely important to protect yourself during your international travel. We do not accept anyone in the program who does not have travel insurance. 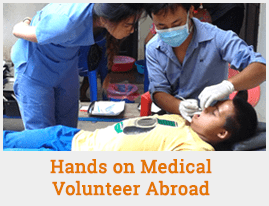 You can buy the insurance of your choice, but RCDP International Volunteer does offer insurance (in partnership with one of world’s leading travel insurance provider) at $3.69 per day. If I have to arrive late, do you offer airport picking-up? Yes, we offer airport pick up for each volunteer. We will pick you up even during late hours. Please make sure to send your flight information to us. One of our local staff members or the coordinator will be waiting by the exit, holding up a sign with your name. If for some reason you can’t find our coordinator, just call him. You will find the phone number in the summer camp information e-book that you will get when you are formally accepted to the program. China is one of the safest counties in the world. RCDP International Volunteer has been running volunteer programs in China for the last 10 years. There has never been a single incident that threatened the safety of our volunteers. We make sure that our volunteer programs in China are very safe. We run the summer English camps in established schools equipped with all modern facilities. The camps are managed by local camp coordinators who will support you during the entire camp period to make sure that things are running smoothly. In addition, we only use safe accommodations. Is there Internet in China? How do I contact home during the program? China is a high-tech country. There is Internet access and all ways of communication in modern cities like Shanghai. You will be able to contact your family through Skype and other apps like Whatsapp. In what kind of room will I stay? You will stay in a hostel, either in a single or shared room. All rooms are equipped with air-conditioner, 24-hour hot water, cable TV, free WiFi, phone access, and security guards who are on watch 24/7. What about pocket money? Can I bring dollars? The summer volunteering in China programs cover most of your expenses (room and food). However, you may still need extra money to travel on weekends or for other personal expenses. What qualifications do I need to apply to the summer volunteer camp in China? You should be a native English speaker with clear pronunciation and have the desire to teach kids. You should also have a clean record and background check, be between the ages of 16 and 60 and be in sound health. Yes, a passport plus one recent photo with your resume. Is there any screening process? How long does it take to make final decision? Yes, the final decisions for volunteering in China will be released within seven days after the application. Sometimes, we will have to arrange a Skype interview to further help with the decision. Once accepted, what preparations do I need to do before coming to China? First, you should have a valid passport with at least six months of validity. Then you should purchase a return flight based on your itinerary. Last but not least, get some pocket money with you, say, $200-1500 based on your personal situation. Where I will be flying to? Shanghai. We may run the camp in other cities, depending on the needs of the schools. If we need to run the camps in other cities, you may need to fly to another airport. We will let you know in advance. Who will receive me at the airport? An RCDP International Volunteer staff member holding a sign with your name will greet you at the exit. We will book a hotel or hostel where foreigners are officially allowed to check in with the local police station. Will this be shared or private accommodation? In most cases, shared. But we will offer private accommodation if requested. What kind of food will be served? When? Breakfast (6:00-8:00 am) and Dinner (6:00 – 7:00 pm) will be offered at the hotel dining area. Lunch stipends will be offered. Is there Internet (wifi) or how can I get wifi and how much it cost? Yes, there will be free wifi at the hotel and work areas. The camp will be run in Shanghai and nearby cities, which might also include Beijing, Shenzhen, Qingdao, and others. How many students will be there in the camp? There will be between 20 and 100 students. What will the daily schedule look like? You can go sightseeing, learn Mandarin, and take part in other activities. Is there any other important information that I need to know? Volunteers are expected to be very flexible, as teaching in the summer camp in China is different from teaching in a regular school. Summer camps are intensive English teaching programs with a specialized focus on conversation skills. Teachers are expected to be flexible, eager, patient, and willing to use different tools to teach. If you love children, then you’ll love this opportunity. The Volunteer Summer English Camps in China are an awesome chance for you if you dream of volunteering and traveling the world but can’t afford expensive fees. If your future dream is to become an English teacher in China or (or anywhere in the world), the summer camps are ideal practicing grounds. The programs are a catapult for beginners. With this opportunity, it is also possible to know whether this is the area in which you want to settle in the future. Enrolling in a summer English camp in China offers you a chance to prove your capabilities. You may find, after working in these programs, that employers were satisfied with your performance. After the session is over, directors can opt to offer you a permanent job in the school. When you join the summer English camp in China, you will have the chance to meet and interact with Chinese students, parents, and teachers. These interactions facilitate the exchange of ideas and give ample learning opportunities to understand more about the Chinese culture, traditions, and values. The summer camps will give you a great opportunity to explore this country.